YES, you can give your cat yogurt; not regularly though but in measured amounts. Also remember, plain yogurt is safe for your cat than the ones available in various flavors like lime, peach, strawberry, banana, coconut, blueberry, cherry, chocolate, vanilla, raspberry, etc., or those sweetened with nuts or raisins. 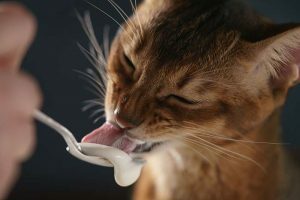 Unlike the flavored versions, plain yogurt does not contain any additive, artificial sweeteners, preservatives or taste-enhancers that might cause any harm to your cat. Many felines have been seen to develop intolerance towards dairy products. But yogurt is an exception in the sense that it has several benefits, and is formed by the action of ‘good’ bacteria which is effective for the cat’s digestive system, aiding in digestion. These bacteria (Streptococcus thermophiles and Lactobacillus bulgaricus) can break down the lactose in the lactic acid present in animal milk. Yogurt contains magnesium, potassium, calcium, and the essential B vitamins. It also has considerable amounts of probiotics that is especially good for cats suffering from diarrhea. Hence, a spoonful of plain/natural or Greek yogurt (good probiotic yogurt brands like Activia), even with a little honey as a sweetener, can be okay as occasional treats. But it is better you serve it at room temperature, rather than the frozen variety. Yogurt can be harmful when overeaten. When the kittens are born, their stomach produces an enzyme that assists them to digest lactose since it is during this time that they depend on their mother’s milk. However, as they gradually develop into matured cats, the production of this enzyme ceases, and many cats eventually end up being lactic intolerant. Hence, yogurt in increased amounts in your cat’s stomach might make it hard to digest, resulting in stomach ailments. Some cats might also be allergic to yogurt made from both cow and goat milk. So, when you first introduce yogurt to a healthy cat, look out for any symptoms of diarrhea, vomiting, loose stool, etc. Contact your vet immediately, if you find any such issues. Published on December 2nd 2017 by admin under . Article was last reviewed on 19th December 2017.